Only $5 shipping and handling PER ORDER (not per item) by U.S. Mail. Express Shipping by FedEx (extra charge applies) upon request. Registration/Login are NOT required in order to shop at Weaver's. Weaver's is proud to offer the new line of premium coffees from Mayberry's Finest! The 12-ounce bags of ground coffees are available in Sunday Morning Breakfast Blend, Otis Campbell's Better-Than-Home Dark Roasted Coffee and Mayberry Diner's Decaffeinated Coffee. Mayberry's Finest coffees are sourced, roasted and ground by the unsurpassed Just Love Coffee Roasters. They know coffee! And we think you'll "just love" this coffee brought to you by Mayberry's Finest! Hand roasts organic and Fair Trade certified coffees from around the world. These words tell everyone that your dream is to "Make America Mayberry Again!" Your choice of a bumper sticker OR a magnet for easier removal. The 2019 Mayberry calendar features photos from all around the town of Mayberry and it availble now. Don't miss out on a whole year of Mayberry fun. Weaver's also has a deal for you just in case you missed the 2018 calendar in the form of a 2019 & 2018 Calendar Combo. The items of Fishing Hole Collection share a common design of Andy and Opie sitting on the bank of Andy's favorite spot for spending the day relaxing and enjoying the outdoors. You can get that feeling with any one of the great items in the collection. You can choose from a zippered pouch, throw pillow, pillow case, blanket, golf towel, woven throw blanket, or a tote bag to hold them all. Be sure to visit the link to see how much relaxing you might want for your very own. This felt pennant features Mayberry colors of the ole' Orange and Blue. White lettering outlined by orange all on a blue background and topped off by a sewn-on orange edge strip. The pennant measures 24 x 9 inches. Perfect for showing your Mayberry pride at home or at work. Limited Edition The Andy Griffith Show 1967 Ford Custom. A 1:64th scale replica of the Mayberry squad car. (Otis told us that Barney may fit but he never would.) This diecast replica is the same size as the 1961 version squad car released in 1998 by Johnny Lightning. This is a LIMITED EDITION run so don't delay and miss your chance to add this 1967 Ford Custom Mayberry Squad Car to your collection. Most of us may not feel like you can step into Andy's shoes but, what about Barney? 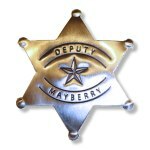 These badges are sturdy, but simplified, representation of Andy and Barney's Mayberry badges. In other words, aren't exact replicas but for the price, you can't beat them. The color is "nickel" and you'll be able to pin it to the khaki shirt of your choice to have that official sheriff or deputy look. 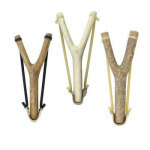 Opie made a deal with Mr. Weaver to hand make each slingshot so they're all one of a kind. The dimensions, wood type, and color will vary because Opie chooses only the best real forked tree branches to make his slingshots. Slingshots are not toys. Adult supervision required. Ages 5 and up. This reference book is one of our fastest-selling books ever. And for good reason. It offers the most complete episode guide of any of the Mayberry books. Fact-filled episode summaries are accompanied by cast notes and trivia for each episode. There also is a section with profiles of the cast, writers and production team for the show, plus a section on memorabilia. There's alway room for Aunt Bee's Apple Pie and now that includes in your closet. You can make folks mouths water with this great looking Aunt Bee's Apple Piie t-shirt. Or, put a fire in your belly and show it off by wearing the Aunt Bee's Kerosene Cucumbers t-shirt. This light gray t-shirt is sure to mean a great dill to you and yours so take this sage advice and get yours today. The design features a "mason" jar with fire coming off the "kerosene cucumber." Written by Scott Hopkins, creator of the no longer produced Mayberry Mania Game and the Mayberry-Opoly game, this brand new book will provide any Mayberry fan hours of enjoyment. This tee will allow you to show your Mayberry Union High spirit and pride in being one of the amazing athletes who have passed through the halls. You can let others know that you were featured in Barney "Scoop" Fife's "Pickups and Splashes from Floor and Pool" sports column in the school paper. The front of the tee declares, "Property of Mayberry Union High Athletic Department" in big bold letters. Have you ever wondered if the Mayberry County Sheriff's Department was the only law in the city of Mayberry, this t-shirt can help answer that question. The Mayberry Police Department t-shirt comes in two styles. Standard collar and Ringer. The artwork has a distressed look to give it an old feel. Your choice of plush sweatshirt, sweatshirt hoodie, or t-shirt will make you all the rage in any seasons. You'll look as "cool as the center seed of a cucumber," all while staying nice and warm in the sweatshirts and add a leather jacket with the t-shirt and you're ready to patrol Checkpoint Chickie or the streets of Mayberry. There's even a mousepad to make your computer have that Phantom Fife feeling when you're online. Weaver's has the original gray T-shirt, the slghtly more "dressy" ringer version with the blue collar and sleeve rings, and the sweatshirt version of this design. Mayberry fans have been enjoying this design for a long time so it's tried and true. It's the biggest thing to happen in Mayberry since the firetruck jackknifed on Main Street. Add a version of this Floyd's Barbershop wear to your collection saluting the world's most beloved barber. Weaver's has our original gray Floyd's Barbershop t-shirt as well as the "dressy" ringer version with the blue collar and sleeve rings. Now we're adding this sweatshirt to the collection so you can wear your appreciation of the best barber in Mayberry in warm and cold weather. Everybody's always talking about the weather but we thought we could do something about it. As Floyd might say, "Every shirt is a walking testimony." Finally, a way to personalized cell phone covers, "yeti" style cups, or anything else with a flat surface you can put a sticker on. The design is the one used on the driver and passenger doors of the Mayberry squad cars but a little smaller. Each sticker is circular (2.5" diameter) 4 mil white vinyl that will show your love of Mayberry to everyone. Maybe you'd like a Goober-Style Beanie Hat Fashioned from brown felt. This hat has the look any Goober will love. Best of all, you get to cut your own holes in the top, just as Goober himself would do. Get your beanie, baby, and say "Yo!" One size fits all. Or maybe being a lawman like Barney is more your style. 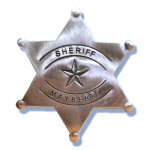 If so this Mayberry Deputy Patch would look good on you. This is a really exciting item for Mayberry fans. Featuring 17 Favorite Episodes, the "Danny Thomas" pilot for TAGS, Clips from Season Premiere nights for 1962 and 1963 seasons, Return to Mayberry reunion movie and MORE! This 220-page soft-cover book of Mayberry trivia and photos was first published in 1985 to celebrate the 25th Anniversary of "The Andy Griffith Show." It has been updated regularly since then with new trivia and additional photos (including some in color). The book treats Mayberry as a real place (and why not!) with biographies of each of the major citizens, alphabetical listings of residents and businesses, town history, and much more. Lots of fun trivia quizzes in all levels of difficulty. Includes a map of Mayberry County. Useful as a reference, but it's primarily just a fun book about Mayberry and its people and visitors. Includes brief episode summaries of all 249 episodes and a list of all TAGSRWC chapters founded through 1999. Weaver's was lucky enough to find this print of the very painting that hangs in the old Remshaw place in Mayberry. If you look closely at the print, you will likely notice that the eyes seem to follow you when you move around the room...of course...it's probably just the lighting. The print is 16"x 20" on heavy weight stock. For more spooky fun, drop by The Old Remshaw Place for FREE Barn-o-lantern, Floyd-o-lantern, Goob-o-lantern and Op-o-lantern patterns. Sales at Weaver's online help support all TAGSRWC activities and also go toward our helping out with a wide variety of Mayberry events and occasions. So when you're looking for gifts to give your favorite Mayberry fan, thanks for thinking of us. We appreciate it.